Thursday, December 20, 2012, was the end-date completion of the 13th 144,000-day Mayan-time-cycle B'ak'tun that began in the year 1618 AD, while the-next-day, the one so-many-people-talk-about, Friday December 21, 2012, marked the NEW very-first-day beginning-point of a new 144,00-day B'ak'tun-cycle, B'ak'tun-cycle number 14. A total of 20 B'ak'tun-cycles of 144,000-days each make-up the big Mayan "Long-Count" Piktun that completes in the distant year 4772 AD. The Piktun began way-back over 5,000-years ago in 3114 BC, when the very-first-fully-enlightened-soul on Earth, Krishna, was alive in India. The Piktun was tracked-daily for a millenium by the Mayan-calendar 'day-counters', caleed "Day-Keepers." Q: So, what-about all-the-hype concerning the so-called "Galactic Alignment" occuning on December 21, 2012? A: Well, according to the US-Naval-Observatory the "alignment" of our Sun with the-center-of-our-Milky-Way-galaxy already-occured in October 1998. So 2012 is tracking 13-years from that-point. So, yes there was a near-alignment, and yes it was connected to 2012. The 1998 near-alignment of our Sun with the edge-equator-plane of our-Milky-Way-galaxy happened in year-12 of a 13-year-cycle that began in 1987. Because our-planetary-time/space-continuum is a numeric-base 13:20 FRACTAL-SET certain non-physical primary-harmonic "potentials" of energy (love) when amplified by intention (will-power) may, by divine-grace, precipitate a "higher-power" spiritual-energy-field event. And the Mayan-calendar actually pinpoints these degrees-of-potentials quite-exactly. Everything is spiritual...only to what-degree! I guess we are all here attending, to whatever degree, Divine U. Time to be-aware of a powerful-'potential'-Divine-possibility that only-recently came-into-Being in 1987. Perhaps summoned-forth with inner-intention-and-prayer during the-very-first-ever planet-wide Weekend-of-Prayer, called the "Harmonic-Convergence" held at all-the-major-sacred-sites-around-our-planet during the wekend of August 16-17, 1987. The planetary-shift in consciousness that-weekend was the-most-important-event in the-history-of-Mankind, according to the-late-psychiatrist-DR. DAVID R. HAWKINS, the-foremost-expert-in-the-world on spiritual-practices-and-consciousness-research. The Harmonic-Convergence, DR. HAWKINS stated, "just happened to occur" at the-same-time as this-major-shift in conscious-awareeness, and was not-because-of-it. DR. HAWKINS said that, "...[B]y grace, the karma of all humanity was transformed..." on that-weekend. All-of-mankind is now potentially-and-karmically able-and-capable of enlightenment, the realization of the-highest-states-of-spiritual-consciousness, . The date December 20, 2012, was Day #160 on the 260 day-Mayan-calendar, named: 4 Ajaw or 4 LORD; 4 Ahau or 4 SUN. That day on the Mayan-calendar occurs every 260-days, every 9-months, in the-13th-Week of 13-days. The year 2012 was the 13th-year ,13 FLINT etz'nab', of a 13-year-cycle, and the number 13 indicates extremely-HIGH-spiritual-potential-consciousness-levels, in the-mid-900's-levels (see this chart) including up-to Level 1,000, extremely-powerful, in the-best-spiritual-sense-of-the-word. The 13-year-cycle 2000-to-2012 wave peaked in the 13th-year, 2012, just like-it-did in the-previous-cycle 1987-to-1999 at the-end of the year 1999. January 13, 2013, began a new 13-year-cycle, the white NIGHT ak'bal years. And, just-like when a new 13-day-week begins and the first 2-3/5 days signify volatile-challenges that correspond to being in "The-Wilderness," the first 2-3/5 years of a 13-year-cycle signify volatile-challenges that correspond to being in "The-Wilderness." This always-seems to include some-kind-of demonic-force-attacks that draw the attention of people away-from peace and love. So there were a-few-challenging-years after December 21, 2012, i.e. Mideast-wars and all the Left-vs-Right social-political-divisions created by-it. 2015 began the year-3 of the current 13-year-cycle, 2000-to-2025, and we-have-witnessed a-lot-of positive-developments-worldwide, i.e., the BRICS-agreements and global-quantum-banking, that began to lay-the-foundations for the "Golden-Age" of Mankind about-to-manifest. This positive-part of the 13-year-cycle "flowers" at the midpoint-year 2019 and peaks-and-ends at the-end of the current 13-year-cycle in 2025. Then the next 13-year-cycle, the blue STAR lamat years, begin in 1926. This new-beginning signifies the start of another 2-3/5 years of 'potential' volatile-challenges until mid-2028. This next 13-year-cycle will "flower" in 2033 and peaks-and-ends in 2038, which also marks the completion of the current 52-year-cycle that began in 1987. In 2039 we begin not-only a new 13-year-cycle, the yellow REED ben years but-also a new 52-year-cycle as-well. Again, 2012 was the year-13 of a 13-year-cycle that began in the year 2000. According to the clinically-proven research of DR. HAWKINS, for the-last-couple-hundred-years and up-until the summer of 1987 the AVERAGE level-of-consciousness of all-people-on-Earth stood in spiritual-darkness at a low-negative-consciousness-level, Level 190. Still, for in All Ages then past, an Awareness witnessed the stillness Awakening as from a Strange Dream, a Wandering Darkness, from which both the Spirits of Selfish Desires and Integrity struggled for Worldly Attention. Until: August 16, 1987, on the weekend of the worldwide Weekend-of-Prayer, the Harmonic-Convergence, but not because-of- it, the AVERAGE level-of-consciousness on our-planet suddenly-jumped from the -negative- consciousness-level 190 up-to the +positive+ consciousness-level of 204 in just-one-afternoon, leaping-ABOVE Level 200 (the critical-point of integrity) for the-very-first-time in he-history-of-Mankind. The Mayan-calendar-day for August 16, 1987, blue 13 LORD ajaw - Day #260, occurs every 260-days. 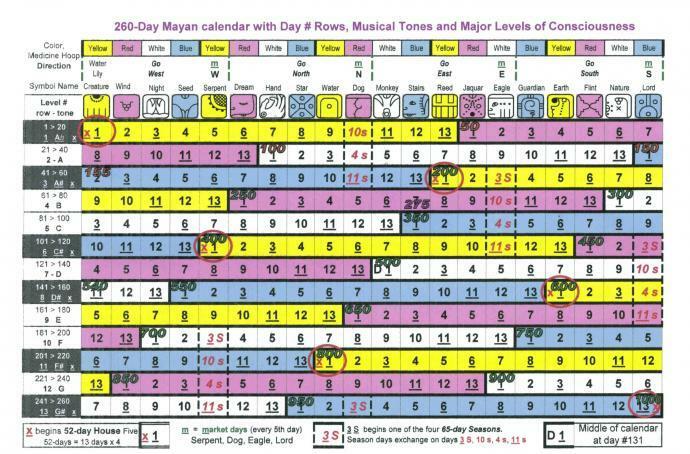 *Note: All-Mayan-dates-here are the exact-proven-accurate calendar-of-the-Guatemala-highlands-Maya "count-of-days." is miscounted by 57 days, as-of 2018.
is misaligned with the-rising-and-setting-cycles of the planet-Venus. For PROOF: see todays-date at the Smithsonian National Museum Of The American Indian website: click-HERE. This-means that according to the Guatemala-highlands-Maya "count-of-days" the Harmonic-Convergence-weekend of August 16-17, 1987, occured on Saturday, 13 LORD ajaw - Day #260 and Sunday, 1 WATER LILY CREATURE imix - Day #1, at the-very-end of the 260-day-calendar AND at the-beginning of a new 52-year-cycle, right on the-most-powerful-day-of-the-calendar: 13 LORD ajaw. And not on 2 JAGUAR hix - Day #54 or 3 EAGLE men - Day #55, as-per the-late-DR. JOSE ARGUELLES using the Yucatan-lowlands-Maya "count-of-days." Sorry. That was hard-for-me to accept at-first, until it-later-became-clear that the Yucatan-lowlands-Maya "count-of-days" is miscounted. 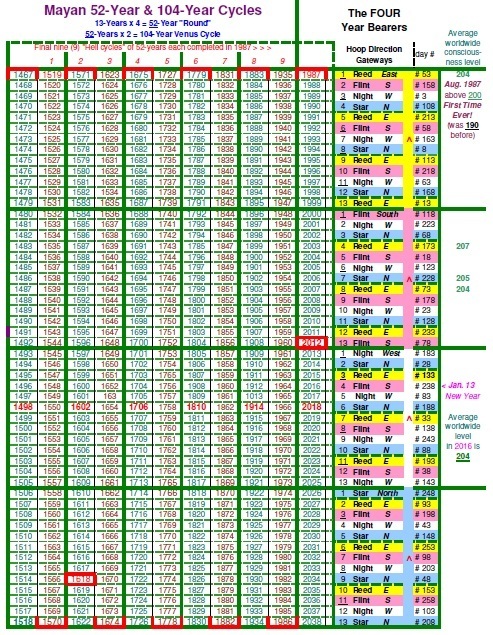 It was hard-for-me to 'switch-over' to using the Guatemala-highlands-Maya "count-of-days" at-first, bu I did, in 1997. And according to various Native-American-Hopi-and-Aztec-elders there is also a "Blue-Star" prophesy. 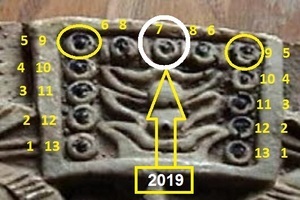 This may-be-related to the 8th Mayan day-sign blue STAR lamat . The very-last 13-day-week on the Mayan-calendar is blue STAR lamat Week-20. This most-spiritually-powerful 13-day-week leads-up-to the-last-day of the 260-day-calendar, situated at the End & Beginning -or- Omega & Alpha of the 260-day-wavelength, at the conjunction of the-most-powerful "time-warp" shift-point at the end of Day #260.. If blue 13 LORD ajaw - Day #260 calibrates at Level 1,000, which is Divinity, then the arrival of blue STAR lamat Week-20 signals the-coming of both the-End and the-Beginning. Most-people have probably never-heard of the "Harmonic-Concordance" of Saturday, November 8, 2003, the-same-date as when the consciousness-level-worldwide again-rose, this time by three-points up to Level 207. This worldwide Day-of-Prayer manifested on Day #208, blue 13 Star lamat, which-again was on the last day of a 13-day-mayan-Week, on Weekday 13, a BLUE-13, this-time in GUARDIAN kib' Week-16, which is right on the "time-warp" shift-point for potential-consciousness Level 800. The average-level-of-consciousness for all-of-Mankind currently-calibrates at Level 204, having FALLEN back three-points since 2003 because of all-the-negative-worldwide-media-attention surrounding the Middle-East-wars and 'terrorism'. But, this still-means our-planet is on a-rising-tide of Truth, integrity, prosperity, unity and stability. For the-first-time-ever, the sacred-Values theat greater-souls hold-so-dear can finally-be permanently-established...the Truth-dom of Divinity-on-Earth, a time of the Dominion-of-Truth. All consciousness-levels OVER Level 600 represent the psychologival-and-spiritual-states of divine-Enlightenment, and the-illusions-of-dualities-and-the-delusions-of-separation-from-Source dissolve into a holistic-knowing byspiritual-revelation and emanation of the radiant-energy-fields of Divine-Being. DR. HAWKINS stated that, In the state of enlightenment 'the world' as most people perceive it, does not even exist. It is a grand-illusion of the-primitive-reptile-brain/ego-mind. The Reality IS that the pathways to our Being-Enlightened are now-available for all Mankind, clinically-proven by science. DR. HAWKINS advice, To always BE Loving and Peaceful, no matter what. So all-of-us, whom are 'seeking' the Truth, are ALL destined to "Be" enlightened one-day soon. Pray for this. DR. HAWKINScstated, To be enlightened one doesn't "do" or "get" anything. For one cannot "get" what one already is. We are being attracted by our Future, to our Oversoul Higher Self, Our Higher Love, and so return once again to Our Very Source...Love & Peace. The 13th B'ak'tun in the huge-time-cycle Piktun "Long-Count" completed on Thursday, December 20, 2012. And then-began a new144,000-day-cycle, the 14th B'ak'tun, the very-next-day on Friday, December 21, 2012. First ... "it" was 1987...and people all-around-the-world gathered-together in large-groups to pray for Good...the Harmonic-Convergence. Then 13-years-later, as the Prince song says, "...we party'd like-its-1999." And then, 13-years from 2000, "it" was the year 2012. December 21, 2012, was Day #160 of the 260-days, day: 4 Ajaw or 4 AHAU, 4 LORD or 4 SUN and by whatever-name it shows-up every 260-days, every nine-months...a birthing-cycle. Peace: the still, blank drawing-board of life, upon-which all-imaginations can-be seen for what-they-are. Every 13-years there is a big-mass-consciousness-'charge-up' that happens, building-up from year 1 and growing-stronger...into that final-13th-year. Like-what-happened in 1999 and now having occured-again in 2012. 2012 was the completion of exactly-TWO-13-year-cycles from 1987. The first-day of the-Harmonic-Convergence, August 16, 1987, was the-end of "Nine Hell-Cycles" of 52-years-each, marked from the-day Spanish-explorer-Cortez landed on the Yucatan-Peninsula sea-shores in 1519 AD, on Day #1, 1 Water Lily Creature imix, in the yellow-year 1 REED ben. Notice-how the-last-year-of-the-last-Hell-Cycle was blue 13 STAR lamat that began in 1986, but the 260-day-cycle that ended-on Day #260 on August 16, 1987, began-back-in-the-previous-year on Dec. 1, 1986, in the blue year 13 STAR lamat. The last-day of the Harmonic-Convergence, August 17, 1987, was "the-first-day" Day #1 - 1 WATER LILY CREATURE imix in yellow year 1 REED ben. And so the Harmonic-Convergence was not on: 2 JAGUAR hix day #54 and 3 EAGLE men day #55 as-per the Yucatan-lowlands-Maya count-of-days used still-now by most followers of the-late-DR. JOSÉ ARGÙELLES. Now, does this-explain the Harmonic-Convergence a-lot-better? I think so! It was hard to-make that change-over to the Guatemala-highlands-Maya count-of-days, I know, but I did.